The German Pinscher is a medium-sized breed of dog, a Pinscher type that originated in Germany. The breed is included in the origins of the Dobermann, the Rottweiler, the Miniature Pinscher, the Affenpinscher, the Standard Schnauzer (and, by extension, the Miniature Schnauzer and Giant Schnauzer). The breed is rising in numbers in the U.S., mainly due to their full acceptance to AKC in 2003. In Australia, the breed is established with a rise in popularity becoming evident. The German Pinscher is a medium-sized dog, usually weighing between 25–45 pounds (11–20 kilograms) and typically 17–20 inches (43–51 centimetres) in height, with a short coat. Colors for this breed include black and rust, red, fawn, blue and tan. The ideal German Pinscher is elegant in appearance with a strong square build and moderate body structure, muscular and powerful endurance and agility. For all countries where the Fédération Cynologique Internationale standard applies, only black and rust and solid red are allowed colors. Colors that became extinct during the world wars of the twentieth century include solid black, salt-and-pepper, and harlequin. A well-bred German Pinscher will be a loving companion with an even temperament. Temperament is hereditary. When considering adding a German Pinscher to a family, it is advised to be able to meet and touch the mother of the puppy you are offered. German Pinschers are generally friendly dogs. They are highly intelligent, quick learners who do not enjoy repetition in training. A well-bred German Pinscher can be trusted with small animals and children, though no dog should ever be left unsupervised with either. If the puppy shies away when faced with strangers, it may be a sign of poor breeding. German Pinschers are very energetic working dogs, in many cases requiring several hours of exercise a day. Accordingly, a large, securely fenced yard is highly recommended for anyone considering the breed as a pet. German Pinschers and water do not go well together. This breed will tolerate baths just to make their owner happy; otherwise, they shun water at all costs. This dog will not bark unnecessarily. 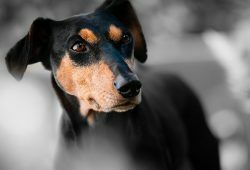 Due to the small gene pool of the German Pinscher, breeders should health test their dogs for hereditary cataracts, hip dysplasia and elbow dysplasia, von Willebrand disease, thyroid disorder, and with the increased incidences of cardiac disease due to irresponsible breeding practices, German Pinschers suspect for heart issues should be removed from all breeding programs.